Vodafone Foundation has mobilised two teams of trained Vodafone employee volunteers to Mozambique to provide communications support for the humanitarian relief programme following Cyclone Idai. 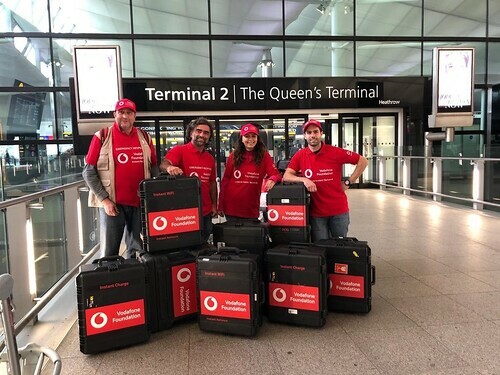 An initial team of employee volunteers from Vodafone Hungary, Portugal, Romania and the Netherlands arrived in Mozambique on Tuesday 19th March, carrying 300kg of Vodafone equipment, including Instant Network, Instant WIFI, Instant Charge and additional satellite and communications technology. As the extent of the devastation and the scale of the need in Mozambique has become clearer, the Foundation has now deployed a second team of trained employee volunteers. The team is currently providing connectivity services through the Vodafone Foundation’s award-winning technology, Instant Network and Instant WIFI at Beira Airport, to enable international aid agencies to coordinate the emergency response. Andrew Dunnett, Director, Vodafone Foundation said, “From our Vodafone colleagues now in Mozambique we understand the communications challenges facing the relief efforts are some of the worst any of our teams have faced in the life of the programme. The team is working around the clock to help provide calling and WIFI operations to support the relief effort and to allow family and friends caught up in this appalling tragedy to connect with each other”. The volunteers are working closely with NGO partner Telecoms Sans Frontieres (TSF) to provide free calling and free mobile charging, and have set up a humanitarian calling operation at the school, Escola Primaria Completa Agostinho Neto, where 600 families are taking shelter. Survivors are able to call, and speak to family members in other locations, using TSF satellite phones and Vodafone Foundation Instant Charge. "We arrived at a primary school called Escola Primaria Completa Agostinho Neto. Inside, we found that there were 600 people sheltered with no electricity and no running water. We set up all the equipment on the sports ground behind the school, which was also devastated with iron pillars on the ground, broken glass, and collapsed rooftops. “Among the first to call was a lady with her baby who managed to call her mother. The moment her mother replied, you could see tears in her eyes pouring down her face. She kept saying, “the house is gone, the house is gone, the house is gone” and then another woman told her “tell them you are ok, tell them you are ok, forget the house, you are ok”. Since 2011, Vodafone Foundation’s pioneering technology, Instant Network, has provided life-saving assistance in over 20 missions around the world connecting tens of thousands of people and enabling almost 3 million telephone calls. Most recently, Vodafone Foundation’s Instant Network was deployed to the Philippines following Super Typhoon Mangkhut in September 2018. The current estimated deployment of the Foundation’s Instant Network in Mozambique is at least two weeks, working closely with Vodacom and partner TSF. Instant WIFI, the Foundation’s latest innovation in a growing portfolio of products, allows up to 500 people to access the internet within an 80-metre radius. For a larger deployment, extra access points extend the capacity and the area of coverage to 1,500 users across 10,000m2. The Instant Network equipment also includes a portable 3G network that packs into three 32-kilogram boxes, and Instant Charge, a durable and portable outdoor mobile charger that can charge 48 devices simultaneously. Vodafone Foundation is at the centre of a network of global and local social investment programmes. Vodafone Foundation’s Connecting for Good programme combines charitable giving and technology to make a difference in the world. Vodafone Foundation is an independent UK registered charity, registered charity number 1089625.